After over 15 years of training goaltenders in ontario, Oshawa based company PRO Goaltending has found its way to Montreal at Concordia’s Ed Meagher Arena. Run by Montreal-born coach Michael Lawrence, the school has produced several professional goalies. Players like Michael Neuvirth, Malcolm Subban and Michael Dipietro have all emerged from the PRO Goaltending program. Since its inception in 2001, the company has been based in Ontario but that changed on July 3, 2017. Lawrence, born on Montreal’s South Shore, knew that he wanted to bring his work back to his hometown. In May of 2016, Lawrence contacted Justin Shemie, who served not only as a scout for the Moncton Wildcats of the Quebec Major Junior Hockey League, but also as Head Scout of the Concordia Stingers. The two hatched a plan, with Lawrence at the head of the company and Shemie leading the Montreal side of things. A year later, they found themselves opening PRO Goaltending’s first Montreal camp. “I’m from Montreal, Saint Bruno. So for me to bring the camp here […] It was a big deal. It was a good day to be home,” said Lawrence after his first day of camp, on July 3. 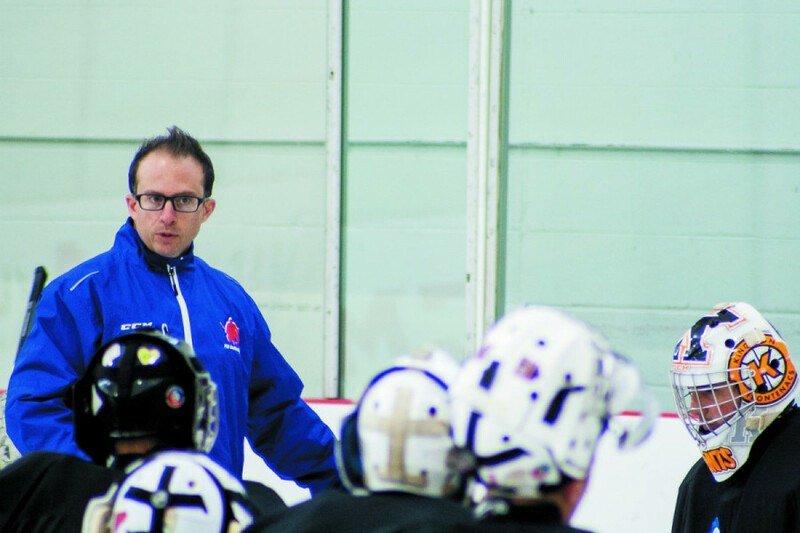 Working with the young goalies of his home province of Quebec is exciting for for the coach. “For me this week is really cool, it lets me see how great my job really is” said Lawrence. Lawrence has coached in the Ontario Hockey League, the Russian Kontinental Hockey League, the East Coast Hockey League. On top of this, he has worked as a goalie coach in the Swiss National League and for team Canada’s Spengler cup winning team. He and Shemie are working towards building something unseen in the province of Quebec. Their goal is to bring in a high level goalie camp that offers something new and different compared to what is available now. Lawrence describes this as “a pro-like camp” that is focused on giving young goalies not only good technical skills, but the tools necessary for a professional goaltender. “I think we’re really different in terms of the structure of our on-ice program, our coaching staff and the exposure [participants] get from pros,” said Shemie. Those professionals include a coaching staff made up of current and former players and coaches from across the many levels of professional hockey. They know what it takes to make it to the level that their students are shooting for. Lawrence and his fellow coaches spent their week-long time at the Montreal camp putting 17 young goalies through rigorous training. Days began with a heavy emphasis on skating before moving on to drills that focus on improving every detail of these young men’s games, from puck tracking to positioning. Along with this came off-ice training and special presentations organized by PRO Goaltending on topics such as mental training, sports psychology and proper nutrition by experts in the fields. The camp’s goalies-in-training definitely picked up on just how different this experience was from their normal training. “I like the training, it’s pretty technical. It’s a bit different from what I’m used to. A good kind of different” said George Soulheris, a participant at the camp and goalie for College Levis. After playing for his former school’s Des Sources Cougars this past year, Soulheris will be moving on to his new team in Quebec city for the upcoming season. Selwyn House Griffins goalie Josh Nadler lives just a short drive away from the arena where the camp is being held. A resident of Westmount, he is the kind of local talent that PRO Goaltending is trying to reach with their new Montreal camp. “It’s a bit different. We spend a lot more time skating and emphasizing all these different techniques […] which is great for our development,” said Nadler describing the camp’s focuses. The camp’s style comes back to trying to prepare its students so that they’ll have what it takes to be a pro. “A lot of these guys have gotten technical skill their whole life but we try [to] teach them more of a system,” said Lawrence. For Lawrence, it is important that his students learn to understand the system behind the way they play, the “why” to what they are doing. The capability to do so and play within that system is a major difference between professional and junior goalies. “The guys we’re working with are so talented. You’re not babysitting. The guys want to be there. The guys are trying to be pros, trying to make the NHL and you’re just trying to help them,” said Beech. The coaching staff knows that they have a rink full of goalies with the right attitude combined with a superior talent level. The company’s goal is to grow that talent long term. Shemie and the coaching staff will be looking to keep in touch with these goalies over the season and see them again next summer. Alex Levesque who had come all the way from Bathurst, New Brunswick was particularly excited to work with one instructor. “Zach Fucale played for the Mooseheads in Halifax so it’s pretty fun […] When I was playing bantam AAA, I used to see him [play],” said the Newbridge academy goalie. Fucale, a Montreal Canadiens prospect, trains with coach Lawrence and spent the week as an instructor at the camp. Getting to train with a goalie like Fucale who has made it to the pro level and is living out his dream is an exciting prospect for Levesque who travelled so far to attend this camp. For Levesque, the experience extends much further than just training with Fucale. “It feels good […᷾] we have a good group. It’s really fun. I learned a lot” said Levesque, smiling ear to ear. For his part, Fucale feels the students are as much of a help to him as he is to them. “I get learn from them too. We all learn from everyone. It doesn’t matter what age or what level you play as a goalie, you can learn from everyone” said Fucale. The attitude and experience of Fucale, Lawrence and the rest of the coaches is not lost on the young goalies. “It feels great having their experience on the ice to teach us. It’s really motivational […] They’re great mentors” said Nadler. As for Lawrence, the best part about the Montreal camp is coming home.